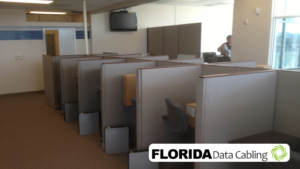 Florida Data Cabling understands how competitive the business market is in South Florida. We are committed to helping your business thrive in this competitive market by providing you with network systems and structured cabling that allow your business to function at its peak. We have been providing professional network cabling services to businesses all across South Florida and have garnered a reputation for excellence, trustworthiness, and high-quality work. When our technicians go to work on your cabling, we focus on creating a system that is secure enough to protect your valuable information, reliable enough so that you can have peace of mind while going about your business affairs, and is of excellent quality so that you know you are getting the most out of your network system and devices. You want your business to thrive in the competitive South Florida market. We want to help you accomplish this goal. We have helped hundreds of businesses in South Florida in places like Wilton Manors, Fort Lauderdale, West Palm Beach, and Miami by installing or improving the network wiring and cabling that they have. Throughout the years, our technicians have earned a reputation for being trustworthy and being able to design and install scalable structured cabling solutions that exceed our client’s expectations. We have experience with all types of structured cabling. Our focus is Cat3, Cat5e, Cat6, and network cabling. If your business needs data wiring, phone cabling, phone wiring, or anything else associated with low voltage cabling, we are the experts you need. We completely guarantee our work. You will be satisfied with the services we provide. We have worked on large projects with hundreds or even thousands of cable drops for places like call centers, data centers, schools, colleges, centers of industry, and centers of manufacturing. We have also worked on smaller offices that require just a handful of cable drops. We are happy to work alongside your IT team or with IT companies in South Florida to create network wiring solutions. At Florida Data Cabling, our expertise includes troubleshooting and repairing problems with your current network cabling. If you have a network cabling emergency, your business can grind to a halt. Every moment that your business is unable to connect to the Internet, communicate by phone, or communicate with devices on the network is money that you are losing. Let us be your cabling emergency buddy. The professionals at Florida Data Cabling want to help you with your network needs, freeing you up to focus on what’s most important to you, running your business successfully. We are a trusted name in voice and data cabling. Our services are delivered on time, on budget, and with minimal disruptions to your daily workflow. Call us today and let us give you a on-site estimate at zero cost.